As you would expect, an Italian Christmas becomes a true Christmas in the kitchen. When I was a child, Christmas was my grandmother’s time to shine (or I should say, to shine even brighter, because the woman was a goddess in the kitchen all year round): she would prepare cappelletti by hand, twisting and turning them one by one, with the skill and the artistry only women of that generation – she was born in 1917 – had. I would supervise and help, in my own way, most likely by sitting at the table and making sure they tasted the way she wanted: I always loved fresh, raw cappelletti and ravioli, and still today, I cannot resist the temptation to eat a couple before boiling them, when I prepare them myself. When I do it, my thoughts always go to her and those warm, fragrant afternoons of long ago, and I do miss her even more dearly than every other moment. And they never taste quite as nice as hers. She loved to talk about her youth and the early years of her marriage with grandpa: they had gotten married on the 26th of December 1939 “at six in the morning and wearing a simple suit, Francesca, not a wedding dress, because the war was coming, we all knew it, and it would have been very inappropriate” (Italy entered the conflict on the 10th of June, 1940). The setting was the Piedmontese countryside of Langhe and Monferrato; the times, the 1940s. The imagery was that of a victoriuous Mussolini and the air had the scent of lavander and Arpège. No wonder I grew up obsessed with history and World War Two: in many ways, I spent my childhood getting to know those years more than the glitzy neon of the 1980s I physically inhabited then. I was saying… Nonna would prepare plenty of things and would do everything on her own. We always ate the typical menu her own mother used to prepare for Christmas and we all embraced the tradition happily although apparently, she used to tell me, it hadn’t been always so. We always had the largest feast at lunch of the 25th, so that was the meal in question. Around Christmas, while preparing cappelletti among other things, she would tell me the story of why it was her own family Christmas menu we traditionally had on that day. She and grandpa were about to spend their first Christmas together and it was time to get all that was needed for the dinner. Of course, they had to deal with living in a country at war, but they came from the countryside and food, there, was still relatively plentyful. The young lovers had forgotten, however, to discuss something seriously important: the menu. Yes, because each household in Italy cooks something different at Christmas, as you would expect in a country known for food and creativity: genio e sregolatezza, genius and unruliness, down to the last corner of the kitchen. My grandfather fully expected his young spouse to embrace his own mother’s risotto and capretto (kid) based menu. Well, let’s just say that wasn’t my grandmother’s – who grew up eating cappelletti in brodo and hen at Christmas – plan. Fights ensued, but she eventually rose victorious over the dispute, although she never wanted to reveal how she convinced grandpa. Today, I wonder if she used her womanly charms: in the end, they were both just over 20 years of age then. This seemingly off-the-topic introduction serves, in fact, a double purpose: the first is to show you how much food, its preparation, its flavors and scents are associated to the memories themselves of Italian Christmases. The second is to demonstrate, with a little funny anecdocte, how varied Christmas culinary tradition is in my country, so varied that at times it changes from household to household. Of course, it would be impossible to conduct some sort of Christmas food census and see what each and every family puts on the table on the 25th of December: can you imagine how long that would take? But one thing we can certainly do: check out what are the best loved traditional Christmas dishes region by region, area by area, starting from our northern regions. If you have Italian ancestry, you may be familiar with some of these habits and it would be nice to hear about you and your memories. If you simply love Italy because, well, it’s Italy, then you may take inspiration from some of these recipes, add a bit of Italian flair to your Christmas meal and maybe create a new family tradition of your own, a tradition grandchildren’ll write about in 70 years, while telling the world how well you cooked and how much they’ll always love you. An Italian Christmas table: what do we all eat? The habit of celebrating Christmas Eve with a large dinner before or after midnight mass is not common in every region of the country. On the other hand, Christmas day lunch is a pretty solid affair everywhere: hen broth is often used to cook cappelletti and dried fruit, nuts and seasonal vegetables are very much on each and every person’s Christmas shopping list, nevermind where they are from. Of course, sweets and cakes are paramount for a perfect Christmas celebration, with pandoro and panettone being sold in every single corner of the country. Typical of an Italian Christmas are also torrone and croccante, as well as mandarins, oranges, pineapple and, as said, dried figs, dates and peanuts. A recent article published by the Secolo XIX, underlines how meat, especially poultry, is the real protagonist of Italian tables on Christmas day: and in fact, pretty much every region tends to have a bird roasting in the oven on the morning of the 25th. It is usually guinea hens and capons being roasted, and hens being boiled in home made vegetable stock. 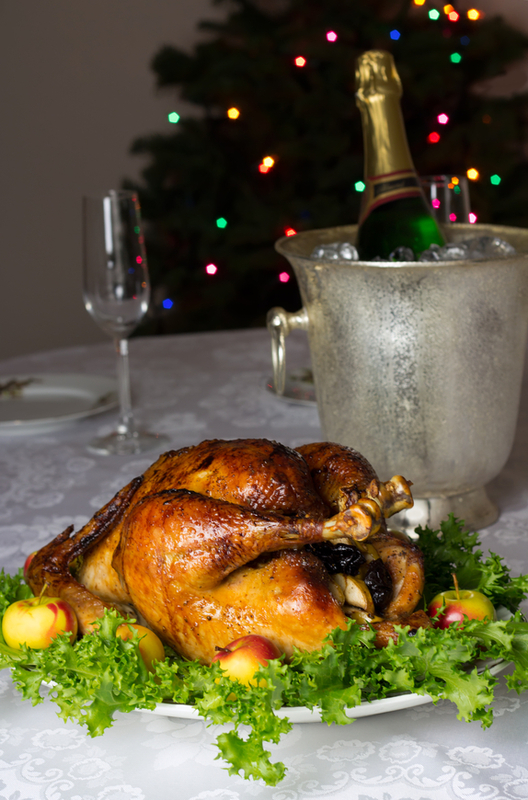 In the period between Christmas and the Epifania (the 6th of January), it is estimated that at least 800 thousand capons and 500 thousand turkeys will be consumed by Italian families. Common dishes, then, but also plenty of variety and differences from place to place, from family to family, even. To begin with, then, let’s take a look to what’s in the ovens and on the tables of northern Italian families at Christmas time. The quaint and dreamy Alpine region of Valle d’Aosta follows tradition down to a “T” when it comes to Christmas: midnight mass, Christmas markets and of course, plenty of delicious food. Typical of a Valle d’Aosta’s Christmas is the fonduta valdostana, a creamy dish made with fontina cheese, eggs and milk, served with toasted brown bread. A soup made with cabbage, stale bread and, once again, fontina, called zuppa alla Valpellinentze. Common is also serving sausages and potatoes as a meat dish, as well as the ubiquitous polenta, often accompanied by carbonata valdostana, a red wine based meat stew. Ah, my beautiful region! Our Christmas table is influenced by the area’s proximity to the mountains, as well as the flavors of the Langhe and their hills. Typical of a Piedmontese Christmas are either cappelletti in brodo or agnolotti al plìn with rabbit or ragù sauce. The agnolotti al plìn are small hand made ravioli, closed with a little pinch, “plìn” in Piedmontese dialect. Their filling is usually made with meat and vegetables and it is very common to have them with butter and sage, or red wine: yes, you read that right, red wine. Many people in Piemonte, especially of older generations, would pour a glass or two of red wine on the agnolotti and eat them like that, without any other type of condiment. In dialect, we call this dish raviöre al Fûm, that is, “ravioli with smoke,” as the simplicity of its dressing almost hints at a complete absence of it: impalpable like smoke. A typical Piedmontese Christmas starter is carne cruda all’Albese, thinly sliced, extra fresh veal, which is consumed raw, dressed with lemon juice, extra virgin olive oil and parmesan shavings. Another must is vitello tonnato, boiled veal, sliced thinly and served cold with a sauce made with fresh mayonnaise, tuna and capers. Bagna Caüda with roasted peppers is also common. The meat dish is usually hen, or roasted capon. Desserts range from the ubiquitous panettone, to torrone d’alba and zabajone, a sweet cream made with eggs, milk and marsala. Liguria mixes the sea and the Alps on the table all year round. Christmas, of course, is no exception. Typical main pasta dishes are, once again, filled pastas such as cappelletti or ravioli alla Genovese, characterized by a meat, egg and herbs filling. The broth is usually made with capon, which is then consumed as a second dish, along with spinach and sausages. Typical of a Ligurian Christmas is also roasted Guinea fowl with artichokes. When it comes to desserts, Liguria is all for its pandolce, which is also known as panettone alla Genovese. It is a fragrant and delicious cake, made with candied fruit and pumpkin, along with raisins and nuts (hazelnuts and pine nuts being the most commonly used). Lombardia at Christmas is synonymous with panettone. Panettone, in Italy, is the quintessential symbol of Christmas and every single Italian family make sure to have one ready for the 25th. But there is more to Lombardia than its most famous, fluffy cake. Just as in Piemonte, tortellini in brodo are a typical primo piatto and roasted capon usually follows. A note on tortellini: Lombardia has quite a variety, in fact. The area closer to the mountains, in the provinces of Bergamo and Brescia favor meat and salame filled varieties, such as the traditional casoncelli. Provinces closer to Emilia-Romagna and to the pianura Padana prefer pumpkin ravioli, usually served with butter, sage and parmesan. Beside the afore mentioned panettone and the ever popular torrone, Lombardia’s Christmas tables love another cake, the sbrisolona, a typical example of Italian cucina povera, made with ingredients that used to be cheap and readily available in countryside farms such as hazelnuts, almonds and coarse cornmeal. It is difficult to think of an Italian Christmas without thinking of the snowy peaks of Trentino Alto-Adige. The region is a must for all those in love with the atmosphere and cheerful air of Christmas markets, but is also a great place to experience the culinary fusion of Italian and central European flavors. Yes, because Trentino Alto-Adige is very much a cultural mix between Italy, Germany and Austria and such a mix is very much present in its cuisine, too. At Christmas, canederli are a must on Trentino Alto-Adige’s tables: called knödel in German, these are deliciously flavorsome bread and milk dumplings, usually enriched with cheese or spinach or speck. I used to live with an Alto-Atesina (this is how we call people from Trentino Alto-Adige) and she used to make me canederli regularly: they are among the most amazing comfort food one can think of, a mouthwatering symphony of buttery, fluffy richness. Do try them, by all means. My personal favorite are those made with spinach! A typical meat dish is roasted kid with potatoes (much like that favored by my grandfather’s family) and dessert would usually be a deliciously spiced apple strudel or the zelten, a dried fruit and spices cake. Don’t forget to make some glühwein, mulled wine, to warm up those snowy December afternoons! The east-most regions of Northern Italy offer us a plethora of traditional dishes for Christmas. Friuli Venezia-Giulia is also a fan of roasted capon, but also proposes peculiar dishes for the period, such as trippa con sugo e formaggio, tripes in sauce and cheese, a delicacy certainly common in Italy, but not only offered at Christmas. Polenta with brovada e muset, a soup made with cotechino (a type of Italian sausage eaten boiled or fried, often with lentils) and turnips. In Veneto, cappelletti or ravioli in brodo are a typical first dish. The broth is usually made with capon, which is then consumed with a horseradish sauce. This is usually served with mashed potatoes and red radicchio salad. Dessert is, of course, pandoro, which hails from the region, but also almond torrone and dry cookies served with a sweet wine called Recioto. Try to experiment with some of the recipes suggested here and then go take a look at what Italians in the Centre and in the South of the country put on their tables on Christmas day: which will your favorite dish be?